Don't miss this one-of-a-kind world premiere! Artistic Director Douglas Martin's Pride and Prejudice is the first ballet based on a Jane Austen novel. 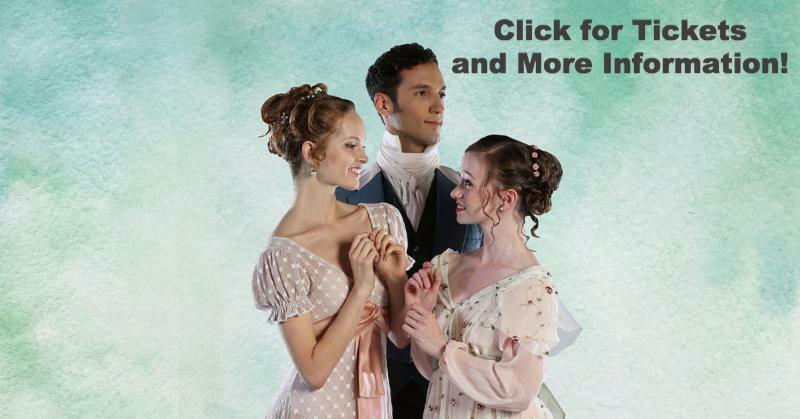 WHEN: Friday, April 21, at 8 p.m. and Saturday, April 22, at 8 p.m.
WHERE: McCarter Theatre, Princeton, N.J.
Join us for the world premiere of Douglas Martin’s full-length ballet, Pride and Prejudice, featuring live orchestral accompaniment by the Princeton Symphony Orchestra under the direction of John Devlin. Martin, the innovative Artistic Director of American Repertory Ballet, brings the 1813 romantic classic penned by Jane Austen to life, celebrating its beloved tale of love, manners and marriage in the English gentry, a broad social class that includes those who owned land (the country or landed gentry) as well as the professional classes (lawyers, doctors and clergy) who did not. Specifically, it follows the main character, Elizabeth Bennet, as she deals with issues of manners, upbringing, morality, education and marriage in the society of the landed gentry of the British Regency. The ballet is supported by the wonderfully melodic music of Ignaz Pleyel, the Austrian-born French composer, with costumes tailored to showcase the fashions of the English Regency period from 1790–1820. This is the seventh world premiere Martin has choreographed for American Repertory Ballet. "The challenge of creating the ballet is that the plot must be advanced in every scene and the music must propel that advancement by creating the mood."